Grazing, when managed properly, can be an important tool for significantly reducing the wildfire threat in large tracts of land. 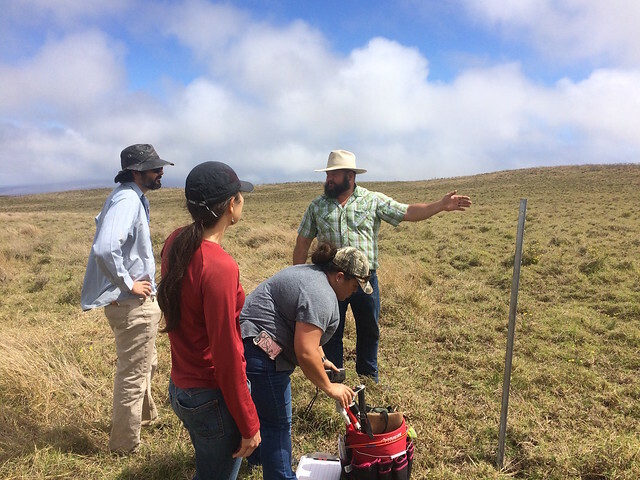 Over the past few months, HWMO has linked with U.S. Army Garrison - Fire and Emergency Services, Parker Ranch, and University of Hawaii CTAHR Cooperative Extension on a project that will prove valuable to land managers interested in using grazing as a fire mitigation tool. To follow-up on the initial data collection on February 19th at the research site, a team of field assistants (Pablo Beimler, Nicholas Krueger, Mele Abran, and Melissa Kunz) joined HWMO’s President and UH CTAHR Grazing Extension Specialist, Mark Thorne, and UH CTAHR Wildfire Extension Specialist, Clay Trauernicht, to monitor changes in fuel characteristics. On the first day of data collection back in February, the team established multiple plots to assess fuel characteristics such as moisture and density at the site prior to grazing. On May 11th, the team returned to those same plots after Parker Ranch brought in their cattle to reduce the fuel in the area. The research team will return to the lab with the data and samples collected to analyze the changes in fuel characteristics. Hopefully this information will prove useful for landowners/managers, particularly for determining a baseline for grazing intervals that would be most effective for fuels reduction and sustainability purposes.